It was the best Shellabration yet! 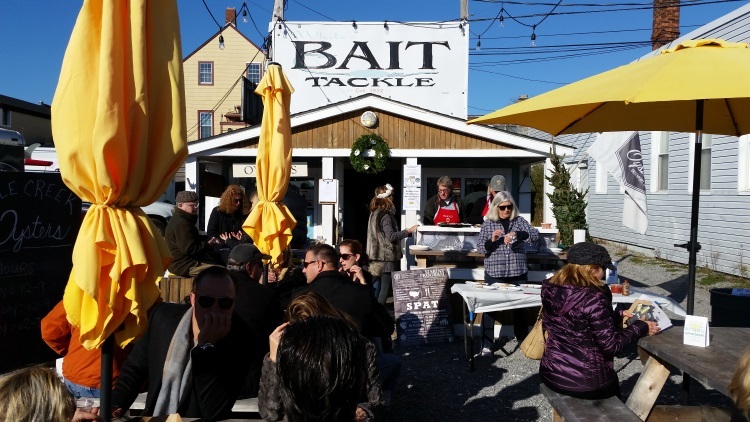 Hard to believe that two weeks have passed since our visit to the 4th Annual Greenport Shellabration on December 5, 2015. The combination of sunny skies, temperatures in the high 50s, and no discernible breeze put smiles on the Shellabrator’s faces and made the food crawl a pleasure. Along with the food and drink, we enjoyed conversations with many fellow guests. If you weren’t there yourself, read on and see what you missed. Remember, there is always next year. Shellabration is a celebration of oysters, clams, scallops, wine, beer, and ale, all locally grown and/or produced. Greenport NY is the venue. The event format is simple… Order your tickets in advance, pick them up along with your Shellabration bracelet, and map, and visit the restaurants of your choice. Ticket proceeds go to support the Cornell University Cooperative Extension of Suffolk County Marine Program. Participating restaurants offer their take on fresh seafood and pour the wine or brew from their beverage partner firm. Your Shellabration map points out each location and tells you which vineyard or brewery has partnered. You get exercise, fresh air, and some delicious food and drink. Yes, there is a small charge for the food and wine. This year, $20.00 covered Marian and me at each restaurant, for two portions, two drinks, and a tip. What was new this year? We attended Shellabration in 2013 and 2014, but this year we had the enjoyment of trying four new (for us) food venues. Basso, Stirling Sake, North Fork Smoked Fish Co., and Industry Standard. No question, we will be back to enjoy each one in more leisurely and focused visits. We started at the Little Creek Oyster Company, on Bootleg Alley, where proprietor Ian Wile was grilling oysters with bacon, and the Greenport Harbor Brewery beer truck was pouring Oyster Stout. Oh, those tickets I mentioned got you the Stout and a couple of freshly shucked oysters. Here is how it looked as we quenched our thirst and planned our route. We loved the food and wine here at last year’s Shellabration, and headed over. So did many others. We were seated quickly but in minutes, there was an hour wait for tables. We enjoyed “Oysters Friskafella”, an excellent chowder, and some seared scallops along with a Sparkling Pointe Topaz 2012 pour. Have a look for yourself. Basso opened this summer as a Venetian version of a Tapas Bar. They served scallops crudo, which had marinated for several hours in olive oil and a subtle spice blend. Along side, McCall Vineyard’s Chardonnay didn’t overpower the sweet scallops. A vegetarian Shellabrator enjoyed her plate of marinated vegetables, declaring her satisfaction aloud. We are glad to see the cluster of restaurant sites at 300 Main St. coming back to life after a period of emptiness and quiet, and Basso is a part of that awakening. Heading further up Main St. we found another new restaurant, Stirling Sake. This is a welcome surprise, as we both love sushi, and we discovered that we both love sake. My go-to beverage in a sushi restaurant is Asahi Super Dry, but the Ozeki sake Junmai from California that we enjoyed cold, with scallops in a sweet marinade, made us perk up. Stirling has that clean and spare look, and a friendly, outgoing owner. Don’t pass up the chance to enjoy his extensive sake list. If you love smoked fish, you will love North Fork Smoked Fish. Marian and I have purchased their products at the Riverhead Farmer’s Market, so we knew the fish, but not the Greenport location. Our tasting plate of smoked trout and smoked salmon, and a fish chowder worked well with the accompanying Borghese Vineyard’s white and rose. Originally, North Fork Smoked was paired with the St. James Brewery, but a last-minute switch featured Borghese and we were happy to see and sample their wines. North Fork Smoked Fish Co.
A friendly couple at the North Fork Smoked Fish Co. venue suggested we try Industry Standard, another new restaurant, located on Front St. OK, we figured it was one for the road, and walked over. We were glad we did. This is a pub-style restaurant, with friendly manager and wait-staff. Industry Standard served a crunchy and delicious Oyster Po-Boy slider with some chowder and Greenport Harbor Brewery’s Anti-Freeze. Anti-Freeze is deep red and malty. Just right for the cold of winter, and it worked great with Industry Standard’s offering. We enjoyed the food, drink, and friendly conversation offered by our hosts and fellow guests. Shellabration is a wonderful opportunity to visit Greenport, visit some of its many restaurants, and pop into the shops. We enjoyed visiting Sleeping Buddha, Burton’s Bookstore, and Kessie during our walkabout. Kessie participated in Shellabration and gave 10% of their proceeds to the Cornell Cooperative Extension’s Back to the Bays Initiative. Finally bushed, we took the convenient ferries back to East Hampton, cutting much driving off the trip. The official start of winter is just two days away, so let’s see what the new season brings. It is time to visit some of our East End museums and cultural venues, so stay tuned. Until then, enjoy your trip around town.